Instant access to data from any internet enabled device! 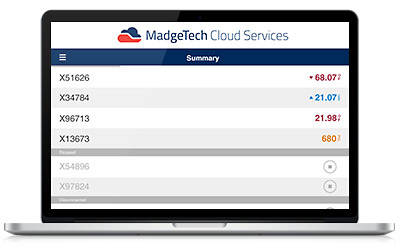 The MadgeTech Cloud Hosted data logging platform provides continuous logging and monitoring of temperature, pressure, and humidity data while giving users instant access from any location. With MadgeTech Cloud Services, a wireless data logger system can securely transmit data in real time to be viewed on any internet or data enabled device such as a computer, tablet, or cell phone. 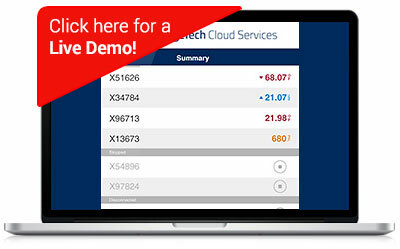 MadgeTech Wireless Data Loggers are compatible with the new MadgeTech Cloud Services, no additional hardware necessary! MadgeTech Cloud Services provides facilities on-demand data supervision, peace of mind and the flexibility to accommodate facilities of all sizes and application needs. Take any 2000A Series, Therm-A-Lert or RFOT and access your data from anywhere! A MadgeTech Wireless Data Logger and Transceiver. A PC with internet access, running MadgeTech Data Logger Software version 4.2.5.0. Data loggers must be running in real time recording mode for cloud monitoring.